The Early Christian Necropolis of Pécs (Sopianae) comprises 16 funerary monuments with a distinctive architecture and impressive murals depicting Christian themes. The earliest monuments date from the second half of the 4th century, when Pécs (then named Sopianae) was an important city in the Roman province of Pannonia. Among the inscribed monuments are burial chambers, chapels and a mausoleum. Typical for the site is the two-storey building, with an above ground chapel and a subterranean burial chamber. Only some of these include mural paintings. 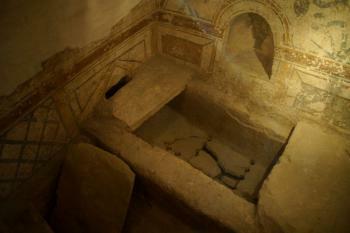 The Early Christian Necropolis of Pécs represents a mix of three categories of sites: it's a Burial site, an Archaeological site of Ancient Rome and a Christian religious structure. Its OUV is mostly derived from its wall paintings. Pécs is a midsized city in the south of Hungary, and I went there for a weekend trip reaching it via a 2 hour flight to Budapest and then a 2 hour 50 minute direct train ride. The town was very quiet, but it had a cosy Christmas fair in front of its landmark (former) Mosque of Pasha Qasim. The core zone of this WHS lies in front of Pécs Cathedral and mostly underneath cathedral square. On my first approach I walked across the glass ceilings from where you can look into the Roman site, but I could not find the way in! So I walked on to the mausoleum which fortunately has a clearly visible structure remaining above ground. It’s all out in the open, this is the only part that you can see without paying the entrance fee. That fee by the way is 1100 forint, about 3.5 EUR, and it covers both the mausoleum and the Cella Septichora visitor center. The mausoleum burial chamber is just a few square meters large, but has all the nice features: a sarcophagus (pieced back together again), colourful murals with recognizable biblical themes and some abstract figures such as a red disk. Via the map on the entrance ticket I found out that the entrance to the visitor center is from the south. It is somewhat hidden as it is an underground structure as well. This entrance connects a number of burial monuments. It is named after the Cella Septichora, an unfinished chapel with 7 apses - fairly large, it can nowadays be rented for wedding ceremonies. Deeper into the complex I found the Wine pitcher burial chamber – well, I found the glass wine pitcher and an intact sarcophagus. But I believe that the chamber itself is closed at the moment (or I did not look well enough in the maze of corridors). At the end of the circuit lies the Peter & Paul burial chamber, the one with the most elaborate murals. As with all other tombs, a glass wall has been placed in front of it for protection. Here it is done at the bottom end, so you look upwards. The glass of course causes a lot of reflection, and this is even made worse by a video screen that constantly sends out coloured flashes. I found the murals hard to see here, only Peter and Paul stand out. Besides the monuments accessible via these two main entrances, there are another two on private property that are also included and supposedly open to the general public. 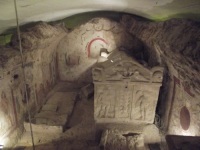 They are the Painted twin grave and an Early Christian burial chapel on Apaca Street at number 8 and 14 respectively. Both are apartment blocks that have seen better times. At number 8 there is a bell marked “Early Christian Burial Chapel – press here”. Strangely the burial chapel according to the nomination dossier is at #14, not at #8, but maybe the person with both keys lives at #8! I rang, but nobody answered or opened the door. At number 14 there’s even no hint that something historical is behind its doors. This site’s most remarkable feature is its age. Dated at the second half of the fourth century, the Pécs necropolis just fails to make the cut for our Early Christianity connection, corresponding to the times that the new religion was still persecuted. Still it is remarkable that just a few decades after Christianity was officially allowed, a construction frenzy occurred in a Roman province town. Its murals also mostly are similar to very early Christian art. The monuments at Pécs however are no match for the much more extensive and better preserved sites in Italy, such as Aquileia (early 4th century) and the Catacombs in Rome (3rd century). For World Heritage enthusiasts Pécs is located in the middle of nowhere, the next WHS is in a straight-line distance of 170 kilometres (Budapest), which is quite a lot on a continent that is so densely covered with World Heritage Sites. Initially the nomination included the entire historic old town, but I think it was a wise decision to reduce it to the Early Christian necropolis. Pécs is a charming town and has a lot to offer, buildings from all important periods of the city's history and interesting museums, but the necropolis is by far the most outstanding monument. The settlement of the Roman period was in the area of today's city centre, the early Christian necropolis is located in the north-west below the cathedral square and the surrounding buildings. The WHS comprises four sites with separate entrances. Best to start at the new visitors centre, the Cella Septichora. After the ticket desk you first come to the remains of the eponymous building, it is also the largest structure of the whole complex, with a length of about 20 metres. The Cella Septichora got its name because of the seven apses. 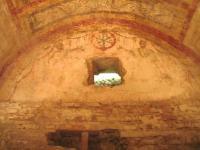 But the main attraction are the burial chambers with wall paintings dating from the 4th century. The largest tombs are two-storey buildings: a crypt and above ground a mausoleum or chapel. Models illustrate the presumed architecture of the most important tombs. First we went to the Chamber with the Jug with well-preserved wall paintings, the jug is painted in the niche on the back wall. A spiral staircase leads to the upper level, from there the tomb is better visible (photo). It is a bit tricky to take good pictures because everything is protected with thick reflecting glass panes. 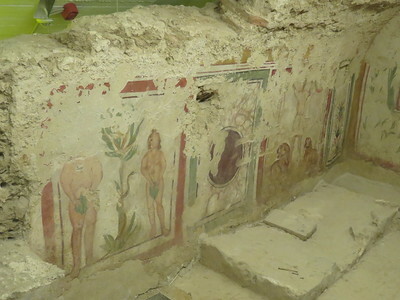 In the rear part of the necropolis are several tombs close to each other, with the most impressive wall paintings in the Peter-and-Paul Chamber: the apostles on the front wall and plants and animals (peacocks) on the vaulted ceiling. Between the ornaments portraits of four young men, possibly the people buried there? The paintings are fragmented, but you can still see a lot of details. The mausoleum is the second site, it should not be missed, although only one room is to be seen. But the frescoes are impressive: the Fall of Adam and Eve, Daniel in the lion pit, and a beautifully decorated sarcophagus. There are two other tombs with entrance at the Apáca street, but they were closed for renovation (August 2014). These sites are regularly open only on weekends (Friday to Sunday), but the pictures in our booklet suggest that we have not missed much. Like other reviewers, we also stayed in the Hotel Palatinus, a nice Art Nouveau building that exudes a bit the old charm of the Belle Époque. Taking the good advice I visited on a Tuesday with no hassles. The underground chamber with its frescoes and sarcophagus was spectacular despite the glass wall. The other sights in Pecs were less spectacular, although I liked the interior of the Mosque Church in Szechenyi Square. I went there on a day trip by train from Budapest, and had plenty of time to see everything. The first advice about visiting the Pecs site is don’t go there on a Monday – you need to go “inside” really to appreciate the WHS and it is “closed” on that day. I put that in quotes since, in our case, this turned out to be “negotiable”, but I wouldn’t want to rely on a successful outcome! The site consists of 4 small locations around the cathedral square. Only 1, the ground plan of an early Christian mausoleum due south of the cathedral, is visible from the exterior. But even this seemed to have an “entrance” to an underground portion which was shuttered we were there –the “open” part was unremarkable. 2 further sites are behind the entrances of buildings in nearby Apaca St – only 1 was marked with a UNESCO sign and the door was firmly locked so I can’t describe what might be on show. The descriptions in guide books are fairly low key. Which leaves the main location. This consists of a series of underground tombs which can only be entered through the Cella Septicora Visitor Centre situated NE of the mausoleum. The original structures consisted of an above ground monument and a subterranean tomb. The passing centuries have seen the hillside slip on top of the remains together with further covering by a sequence of subsequent (re)building/destruction etc – the result is a 2 storey subterranean archaeological site consisting of remains from both levels. Those reached via the Visitor Centre are largely “tunnelled” well into the hillside and are reached via spiral staircases etc. The Visitor Centre is partly “glass roofed” and this portion can be walked over. We looked down through the glass to see the remains below – these consisted of a few uninteresting “walls”. But, surprise surprise, there were people walking around despite our being told that the Centre was closed!! The door was indeed unlocked but the desk staff were adamant – it was only open for “Groups”!!! Well couldn’t we be a group of 2?? No, that wouldn’t be possible. So, we went through all those strategies well known to thwarted travellers facing intransigent staff! Pleading, flattering, cajoling, grumbling etc and eventually – success! Inside, the “star” tomb is the Peter and Paul Crypt with 4th C frescoes depicting, inter alia, Adam and Eve, Noah and Jonah in wonderfully “naïve” style. The entire structure is interesting with its passageways and stairs leading to a number of different tombs. Pecs has received positive reviews on this site as a town to visit and savour. It is pleasant enough and was a European City of Culture in 2010. The AB evaluation for the Paleo-Christian tombs makes it clear that Hungary’s original intention was to nominate the entire historic centre, and indeed ICOMOS carried out a visit on that basis. Very late on, the nomination was scaled right back to consist solely of the tombs – correctly I think, as Pecs’s other attractions are not at the “World Heritage” level but that hasn’t prevented many other towns getting inscribed! Located in Southern Hungary near the Croatian border, Pécs is Hungary's second-most visited city, and rightly so. It has a compact old town which can be easily explored on foot, with buildings from many epochs (late Roman to 20th century) and religions (churches, former mosques converted into churches, active mosques and synagogues). The Roman sites are very central and very well signposted (they make a lot of their WH status). There is a brand new visitor centre above the main site, called Cella Septichora. The remains themselves are reasonably interesting (of course nothing compared to Rome, but nice for a provincial town), and show biblical scenes from the dawn of the Christian era in the Roman Empire. Pécs is connected by direct trains to Budapest and Vienna. Like Christer, I stayed at the Palatinus, which is a really nice and traditional hotel. As in many places in central and southern Europe, it all started with a Roman settlement. By the foot of the Mecsek Hills they found water, fertile soil and a generally nice place to stay at. They named the town Sophianne and it became the centre of Lower Pannonia. The Romans also brought Christianity with them and the World Heritage Site of Pecs is about exactly this – early Roman, Christian tombs, in a condition not found anywhere else in the world. All the Roman tombs are centrally located around Pecs’s beautiful Basilica of St.Peter with its four towers. The tombs are small and narrow and Christian symbols decorate the graves. There are biblical frescos, Adam and Eve, Daniel in the lions den and the Jug – the Holy Sacrament. The Roman tombs are easily visited in a one or two hours if you are in a hurry, but in my opinion Pecs is worth a better destiny. The town is actually considered to be the second most beautiful city in the country after Budapest and having stayed around for a couple of days I can surely agree. It’s a fine climate and today the Old Town is just filled with beautiful architecture making it a perfect stop for a couple of days. After the Romans, Pecs got back on the map again in the Middle Ages as a major stop on the route to Byzantium. But then the Turks attacked and made it into an administrative centre, which is the reason why you find the best preserved mosques in Hungary in Pecs. See the tombs but stick around for a day or two and I promise you will appreciate the small town of Pecs. And why not stay at the Hotel Palatinus, a beautiful Art-Noveaux palace, located right in the middle of the Old Town. From "Pécs (Sopianae) Early Christian Cemetery" to "Early Christian Necropolis of Pécs (Sopianae)"
Reduced from broader TWHS: TWHS originally included later monuments, mainly art nouveau. 115 Community Members have visited.